What a wild and crazy day on the National Hockey League ice Tuesday night. Three players registered hat tricks and we had a goalie with a milestone shutout, too. The box scores were also littered with a bunch of multi-point performers. The game between the Columbus Blue Jackets and the Calgary Flames featured a total of 15 goals, and was the fantasy fiesta of the evening. But that was far from the only game with big fantasy numbers. Some of the big stat lines were expected, but there were plenty of surprises, too. Let's get started! For NHL news and fantasy advice, find me on Twitter here! The Florida Panthers are hanging around .500, but when they're on their game they can be very dangerous, especially at home. 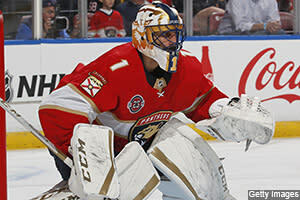 Roberto Luongo has dealt with a bevy of injuries this season, but when he is in the crease he is showing he still has plenty left in the tank. Louie returned from a five-game absence, turning aside all 33 shots he faced on Tuesday night in a 5-0 victory against the Boston Bruins. He posted his 77th career shutout, passing both Ed Belfour and Tony Esposito to move into sole possession of ninth place on the NHL's all-time shutout list. Auston Matthews missed 14 games due to a shoulder injury, but even with that absence he is among the league leaders on offense. He has lit the lamp 15 times over just 14 games, including five goals and two assists in his three games since coming off the Injured Reserve list. He also chipped in with an assist, a plus-3 rating and two blocked shots, as he continues to roll up huge numbers. The Leafs moved to 20-8-0 with 40 points, and, oh yeah, they have more firepower on the way with William Nylander skating and working on his conditioning after a contract dispute. Can you imagine Matthews being even better, with Nylander perhaps joining his line? Patric Hornqvist likely tops the fantasy charts most nights, but not on this special Tuesday. He posted a natural hat trick in leading his team to a 6-3 victory against the visiting Colorado Avalanche. The three goals came within a span of 2:47, the fastest hat trick in franchise history, as Semyon Varlamov's head was spinning. He considered the last two goals lucky, but sometimes it's better to be lucky than good. Actually, Hornqvist is both. He also added an assist with a plus-1 rating and a team-best eight shots on goal while adding two blocked shots and two hits, filling up the stat sheet for his fantasy owners across the board. Johnny Gaudreau was one of many players in the Calgary-Columbus tilt to see a huge fantasy stat line (see below). Johnny Hockey was particularly impressive, posting two goals with four points, a plus-3 rating and four shots on goal in just 18:57 of ice time. He opened the scoring at 6:24 of the first period, beating Sergei Bobrovsky, and then he scored the 13th goal of the game at 6:29 of the third period, including his team's lead to 8-5. The Flames ended up winning 9-6 in a game which resembled more of a video game than an actual game. Max Domi looks like he has found a home in Montreal. It's not that he was a huge disappointment for the Arizona Coyotes, but he just never looked very comfortable. He scored two goals with an assist, a plus-3 rating and a blocked shot with four penalty minutes in Tuesday's win over the Senators. He also has 13 goals after tallying nine markers in each of the past two campaigns. Domi is on pace for 88 points which would be five more points than he has tallied in 141 NHL games over his past two seasons. His career best came in 2015-16, his rookie season, when he lit the lamp 18 times with 52 points. He appears on track to shatter all of his previous best across the board. As mentioned above, the Flames and Blue Jackets hooked up for 15 total goals in their fantasy fiesta in C-Bus on Tuesday night. Can you imagine having a ticket to that game? The only people who weren't satisfied were the goaltenders, the head coaches, as they're never really happy about anything, and fantasy owners of said goaltenders. Sean Monahan equaled the production of Gaudreau, posting two goals with four points and a plus-3 rating while winning 10 of his 14 faceoff (71.4 percent) opportunities. Matthew Tkachuk wasn't far behind with a goal, three points and a plus-1 rating while adding a hit. Matt Giordano was one of three Calgary players registering at least three points, as he had three helpers, a blocked shot, a minor penalty and four hits. Giordano is normally known for his prowess as a blocked shot specialist, but he was in a hitting mood on Tuesday. He has three goals, 27 points, a plus-14 rating, 24 hits and 50 blocked shots in 28 games to score well all over the place. Elias Lindholm also continues to hum right along in Calgary, picking up another goal with an assist and plus-4 rating, as he has certainly enjoyed his change of scenery from Raleigh to Calgary. Travis Hamonic also got on board with two assists. The home team was putting up plenty of crooked numbers, too. Sergei Bobrovsky was tagged for eight goals on 26 shots, so his fantasy owners weren't tickled by the result. However, anyone with stock in Seth Jones, Ryan Murray or Artemi Panarin were certainly pleased with their two assists each. While Jones had a minus-2, and Panarin was a minus-3, Murray stepped up with a plus-3 rating to go along with three blocked shots and a minor penalty. And how about the quietest hat trick in quite some time? Cam Atkinson registered a hat trick, and he now has points in 11 consecutive games dating back to his last scoreless effort on Nov. 6 against Dallas. He has 13 goals with 19 points during the impressive span, including two hat tricks and at least one goal in nine of the contests. Quick Hits: Nate Schmidt racked up two goals, including a power-play game-winning tally late, as the Golden Knights sunk the Capitals in a Stanley Cup Finals rematch. The goals were Schmidt's first two of the season, so he has a ways to go before he is a fantasy must-start outside of deeper formats. … Adin Hill won his fourth consecutive start in place of the injured Antti Raanta, topping the Kings 2-1. … Aleksander Barkov posted three assists with a plus-1 rating and two blocked shots. He has three goals and eight points during his current five-game point streak to make his fantasy owners smile from ear to ear. … Partner in crime Mike Hoffman remains on a career pace. He picked up two more goals with an assist, giving him 14 goals and 26 points across 26 games this season. Since landing in Sunrise he has gone from being a serviceable fantasy option to a must-start in all formats. … Jonathan Huberdeau posted a goal and three points with a plus-2 rating, and he has a ridiculous six-game multi-point streak. Huberdeau has three goals and 14 points during the amazing run. … Nikolaj Ehlers picked up a goal for Winnipeg, giving him five goals and eight points over the past seven outings. … Connor Hellebuyck won another start, allowing just one goal on 28 shots. … Kris Letang went for two assists and a plus-1 rating with two blocked shots and two hits to fill up the stat sheet. … Jack Eichel and the Sabres came up short in overtime against the Leafs, but he did well. He had a pair of goals with a plus-3 rating and eight shots on net. Rasmus Ristolainen was also at it again for the Sabres, picking up two assists with a plus-1 rating, three blocked shots and three hits. He has 17 points through 29 games, but his real value is in the hits (91) and blocked shots (49) categories. … Gustav Nyquist picked up two more goals with a plus-1 rating, and he has four goals and seven points with a plus-3 rating over the past five outings. … Mikael Granlund added two more assists, giving him a goal and nine points in the past six battles. … Josh Leivo made his debut for the Canucks and he opened the scoring, endearing himself immediately to his new teammates. He is working with Elias Pettersson and Brock Boeser as a top-six forward, so Leivo is a nice buy-low candidate. … Jakub Vrana scored two goals for the Caps in a losing effort in Vegas. … Tom Wilson suffered an upper-body injury when he was smashed by Ryan Reaves in that battle. Reaves scored a power-play goal, but also had 15 PIM and was given a game misconduct for his misdeed.